The countryside in the heart of the Bavarian Forest uplands offers ideal conditions for an active holiday close to nature. 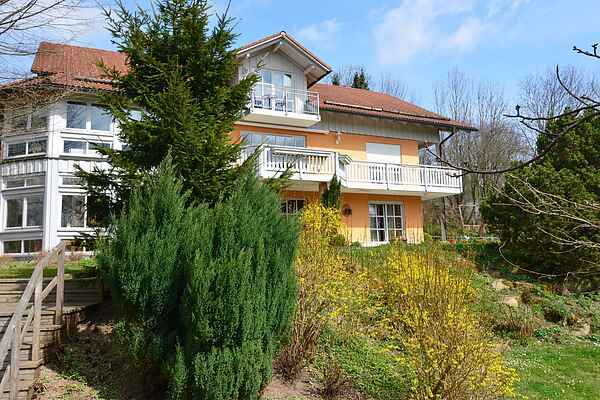 This fully equipped holiday home is located in a tranquil setting on a forested south slope in Bernhardsberg, a district of Waldkirchen. The holiday home is on the first floor. From the balcony you have a wonderful panorama of the valley and the surrounding mountains of the Bavarian Forest. You are also free to use the large garden with a sitting area and terrace to enjoy a relaxing holiday to the fullest. With a wide range of leisure options, there is something for everyone at any time of year: hiking and biking trails, paragliding, mountain biking, Nordic walking, hiking, horseback riding, golfing, cross-country skiing, downhill ski runs and much more. Favourite daytrip destinations: treetop walking trail, the city of Passau, Steinwelten Hauzenberg, Pullman City, Dreisessel (national park), Waldkirchen water park.